Project obstacles and solutions: An abandoned railway line that runs from North Judson to State Route 35, north of Winamac, Indiana was being converted into a walking trail. The trail was funded by INDOT with federal stimulus money. The contract was awarded to Walsh/Kelly Construction to excavate and pave the old rail line. However, the customer desired to divide the the 6 mile stretch so it could accommodate both equestrian riders and foot traffic. Literally half of the trail was to be paved with asphalt and the other half to be open aggregates. Since horses are susceptible to abrasions on their hooves if they walk on angular stone, it was decided to use rounded gravel for the project. Walsh/Kelly contacted IMI to supply #53 non-angular gravel for the base of the horse walking trail and #4 borrow for the surface. This was compacted together to complete the 6 mile trail. 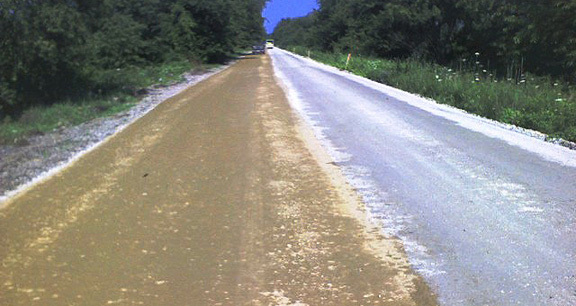 This is the first split gravel/asphalt trail of its size in Indiana.